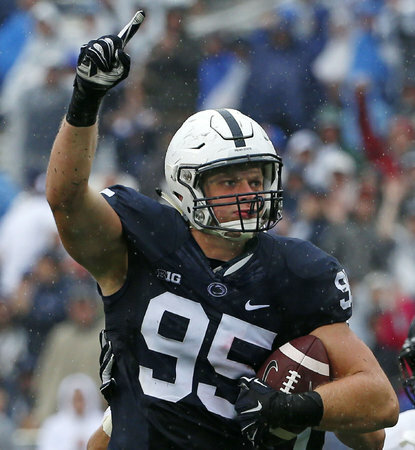 Penn State’s Carl Nassib hit it big yesterday. He won two of the top defensive awards in College Football. He won the Rotary Lombardi Award for the nation’s top lineman or linebacker. Nassib also received the Ted Hendricks Award earlier in the day as the nation’s top defensive end. Nassib had a monster season. He led the NCAA in sacks with 15.5 for the year. Guys like Orlando Pace, Ndamukong Suh, Juilius Peppers and Warren Sapp are among some of the big name former players that have taken home the Lombardi award in the past. Bill O’Brien, the former Penn State coach, now head coach of the Texans was happy for Nassib. Nassib, a fifth year senior will be eligible for the 2016 NFL draft and could make some lucky team very happy.